The A1A Dock Products Lift Ladder is an innovative, retractable ladder featuring a new and improved heavy-duty rung hangar. To extend the life of the ladder, simply pull up the lower section above the water line to eliminate marine growth. The plastic coated lift cable will provide long lasting service. The Short based lift Ladder has a fixed portion that extends only 14 1/2 inches down from the top of the dock. Available in standard (2") and wide (3.5") step versions. 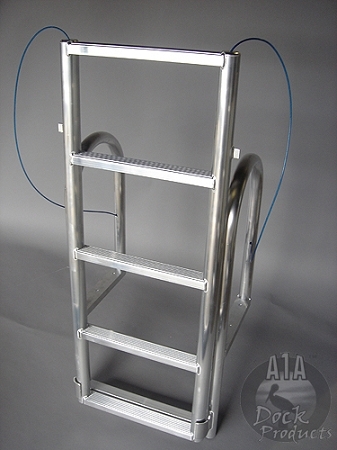 The Quick Release is also available for this ladder.